Filariasis is an infection caused by Filarial Worms. This disease can attack animals and humans. Filaria parasites have hundreds of species, but only 8 species can cause infection in humans. Filariasis groupings are generally categorized according to the location of habitat for adult worms in the human body. Some types include skin, lymphatic filariasis and body cavities. This article will discuss in more detail about lymphatic filariasis. In 2000, the WHO estimated that there were around 120 million people in the world suffering from lymphatic filariasis. One third of them have severe infections that change the shape of infected parts of the body. Parasites that can cause this type of filariasis include Wuchereria bancrofti, Brugia malayi , and Brugia timori . W. bancrofti is a parasite that most often attacks humans. It is estimated that 9 out of 10 lymphatic filariasis sufferers are caused by this parasite. While the rest is usually caused by B. malayi . Filarial parasites enter the human body through the bite of an infected mosquito. The parasite will grow into a worm-shaped adult, survive for 6 to 8 years, and continue to multiply in human lymph tissue. 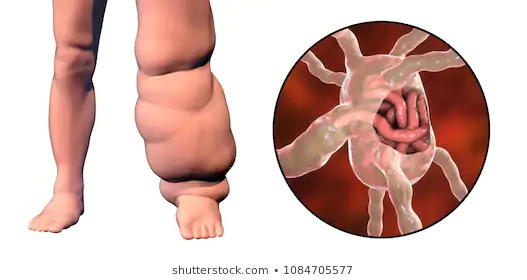 This infection is commonly experienced since childhood and causes damage to the lymphatic system which is not realized until severe and painful swelling occurs. The swelling can then cause permanent disability. Are You Know : What Is Diverticulitis? Based on the symptoms, lymphatic filariasis is divided into 3 categories. This grouping includes asymptomatic, acute, and chronic conditions. Most lymphatic filariasis infections occur without showing any symptoms. However, this infection still causes damage to the lymph tissue and kidneys while affecting the immune system. Acute lymphatic filariasis is divided into 2 types, namely acute adenolimfangitis (ADL) and acute filarial lymphangitis (AFL). If you have ADL, the patient will experience symptoms of fever, swollen lymph spots or lymph nodes (lymphadenopathy), as well as pain, redness, and swelling in the infected part of the body. ADL can recur more than once a year, especially in the rainy season. Fluid that builds up can trigger fungal infections and damage the skin. The more frequent relapses, the swelling can get worse. Whereas AFL caused by adult worms that are dying will trigger symptoms that are slightly different from ADL. This condition is generally not accompanied by fever or other infections. AFL can also trigger symptoms such as the appearance of small lumps on the body where the dying worms accumulate (for example in the lymph system or in the scrotum). In the case of chronic lymphatic filariasis, lymphedema or buildup of fluid causes swelling of the legs and arms. Fluid accumulation and infections that occur due to weak immune system will eventually lead to damage and thickening of the skin layer. This condition is called elefantiasis. In addition, fluid buildup can have an impact on the abdominal cavity, male testicles and breast in female sufferers. The diagnosis of lymphatic filariasis can be done through blood tests and urine tests. Both of these tests will detect the presence of filarial parasites in the patient's body. Blood tests will be done at night when the parasite is active. Ultrasound is also sometimes needed to detect changes in the lymph system and adult worms in the male scrotum. Surgery for men with hydrocele, a buildup of fluid in the scrotum. Do light exercise for parts of the body that experience fluid buildup to trigger the drainage. Clean the swollen parts thoroughly with soap and water every day to prevent infection. Sleep in a mosquito net. Clean the puddles around the house. The spread of lymphatic filariasis can also be stopped through preventive chemotherapy procedures for people who live at the site of the infection and its surroundings. 0 Response to "What Is Filariasis"